If you’ve been using milk or plain water as the liquid base for your smoothies, there’s another option that can offer plenty of health benefits. Coconut water is an easy way to add a tropical vibe to your smoothies and is perfect for using in tropical smoothies or adding a tropical taste to any smoothie. Coconut water is a great, natural source of key electrolytes. This can make it a superior choice to plain water if you feel that you need a boost of these and want to get it through your smoothies. It also contains some important nutrients, including vitamins and even healthy fats. If you want a liquid base that is going to give you more bang for your buck in terms of nutrition, you can definitely do a lot worse than coconut water. It’s not a base you’re going to want to use all the time though because of the sodium content but it’s a great option for switching things up every so often. 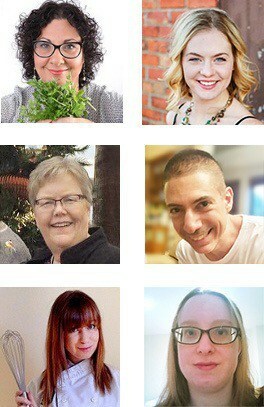 Excited to learn more about how you can use it in your smoothies? Read on for some of our favorite coconut water smoothies! Is Coconut Water Better Than Water? Is Coconut Water Good For Your Hair? Is Coconut Water a Diuretic? Is Coconut Water High in Potassium? Is Coconut Water High in Sodium? Is Coconut Water Safe During Pregnancy? Looking for a post workout smoothie that will rehydrate you? This smoothie definitely fits the bill! Coconut water is full of electrolytes that will help you to bounce back after you’ve exercised and banana is a good source of potassium too. We’re also using a touch of coconut milk, which contains manganese for a more stable blood sugar levels. It’s also perfect for adding lots of dairy-free creaminess to this smoothie. There’s even a vitamin C boost from the strawberries. Peel and chop the banana. If you’re using fresh strawberries, hull them and chop them into pieces. Add all of the ingredients except the natural sweetener (if you’re using this) to your blender. You may need to pulse to begin with and then blend until smooth. Once fully blended, add your choice of natural sweetener if you feel it’s needed and continue blending. 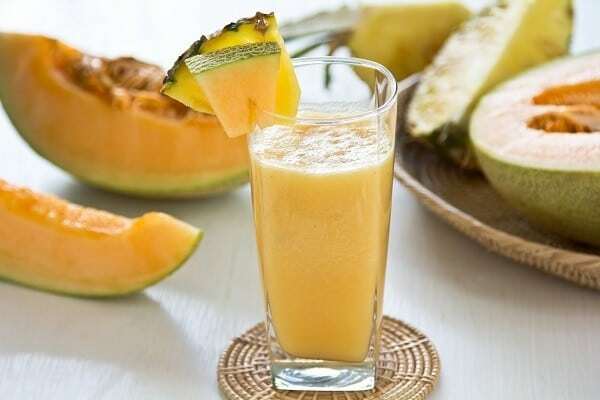 This smoothie has a delicious tropical taste thanks to the coconut water, mango and pineapple. It’s also the perfect choice if you want a natural and healthy alternative to a not-so-healthy energy drink after exercise. 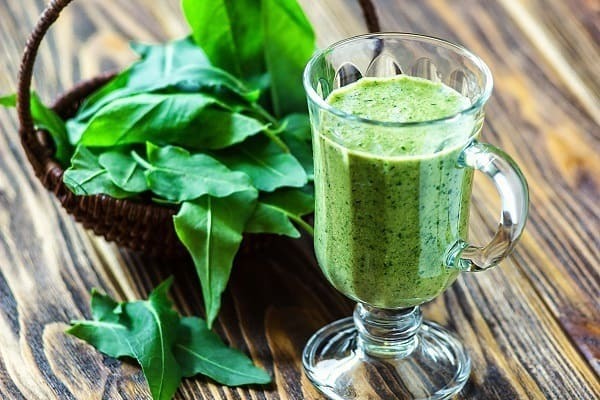 For anyone who loves Gatorade style drinks, sipping on this smoothie is a natural and super healthy way to get electrolytes such as potassium and sodium. Plus, a whole lot less salt and sugar and no artificial additives or colors. If you’re not using frozen fruit, chop up the mango and pineapple into chunks. Peel and chop the banana too. If you want a smoothie is refreshing and hydrating, look no further. The overall taste of this smoothie is slightly tart but with a hint of sweetness. You’ll get a good dose of key nutrients such as potassium and vitamin C, and some pretty powerful antioxidants too. 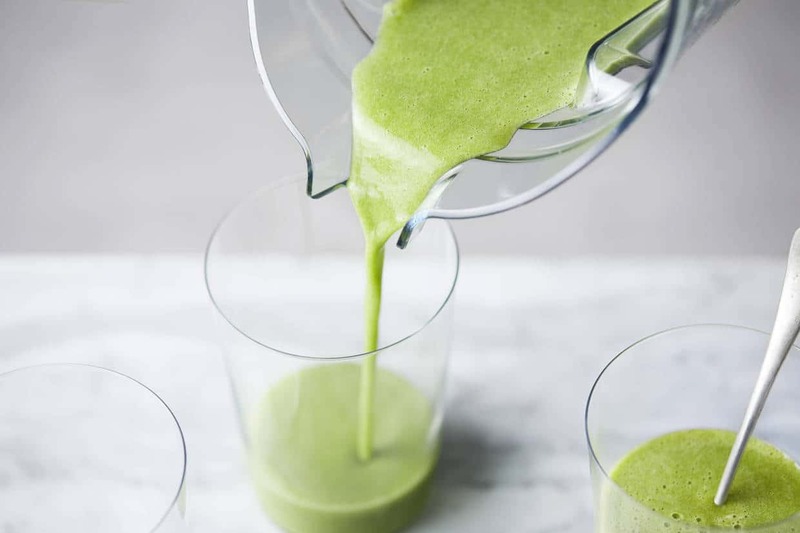 Suggested: 15 Kale Smoothie Recipes That Actually Taste Great! There are even healthy fats from the chia seeds. There are only a few ingredients involved in this smoothie so it’s a great option if you’re looking for a quick and easy smoothie recipe. It’s also pretty low in calories and a weight loss friendly smoothie. 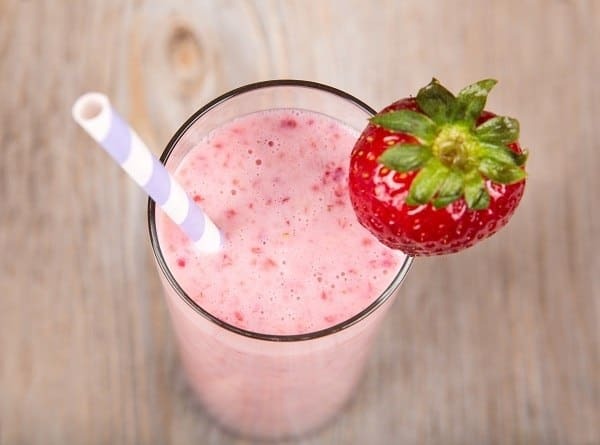 We’re using frozen strawberries in this smoothie but you can also use fresh ones. Just add a few ice cubes to get the same result. If you don’t want it particularly sweet, you can choose to leave the honey out. If you’re using fresh strawberries, hull them and chop into pieces. Want a super healthy and really nutritious smoothie? This one ticks so many boxes! There is fiber, manganese, vitamins C, E and K, calcium, potassium, omega 3 fatty acids and iron, to name just a few of the nutrients you’ll get. Plus, ginger and cinnamon are both anti inflammatory. Hopefully these coconut water smoothie recipes have got you super excited to learn more about some of the benefits that coconut water can have for your health and wellbeing. Lots of studies have looked at the hydration effects of coconut water, particularly in comparison with plain water. The general consensus is that coconut water does have the ability to hydrate, it doesn’t do this better than water. One of the reasons why you might want to enjoy coconut water smoothies after exercise is the electrolytes that it contains - notably magnesium, calcium and potassium. Rebalancing your levels of these electrolytes is thought to help muscles to recover more quickly after a workout. Potassium may encourage better hair health due to its potassium content. You’ll get just over 400 mg of potassium in a cup of coconut water. Potassium has been linked to hair growth. Coconut water is also a great source of several other nutrients that are needed for healthy hair. It contains vitamins, amino acids, electrolytes (not just potassium) and even omega 3 fatty acids. Coconut water is sometimes used on the scalp to treat dry and flaky skin. Coconut water has a pH of around 5.4. This makes it a bit less acidic than plain tap water (which usually has a pH of around 7.5), still bottled water (which can be a similar pH level) and sparkling bottled water (which has a pH of up to 5.5 on average). Some Ayurvedic studies indicate that coconut water may have a slight laxative effect. This could be linked to the magnesium content, which can have a laxative effect in relatively high doses. Scientific studies haven’t found the same results though so you’ll probably need to be drinking a lot of coconut water to get this side effect and most smoothies aren’t going to use enough of it for this! Ayurvedic studies have suggested that coconut water may also have diuretic effects but again, this isn’t widely backed up by scientific studies. As with the laxative effect, a normal amount of coconut water isn’t likely to act as a diuretic but you may experience some issues if you go ahead and drink a lot of it. The average smoothie isn’t going to use enough coconut water to have this effect though so don’t be afraid to use it in them! Potassium is needed for keeping your heart and muscles in good condition. The recommended amount of potassium for people who aren’t on a potassium restricted diet is between 3500 mg and 4500 mg per day. However, it is a bit of a balancing act as too much potassium can be dangerous for your heart. If your potassium levels go too high, it can lead to a heart attack. Coconut water smoothies can help you on your way to the amount that you need, as coconut water contains around 404 mg of potassium per cup. This is a fairly amount of potassium. The potassium content in coconut water can help to protect against kidney stones. Coconut water contains around 64 mg of sodium per cup. This is quite a lot higher than plain tap water, which contains around 7 mg of sodium for every 12 ounces. This is one reason why you’re probably not going to want to be drinking coconut water smoothies every day, as it does pack a fair amount of sodium in. There is a bit of confusion as to whether coconut water is safe to drink during pregnancy. You may read that it isn’t entirely safe to consume coconut water and that you should avoid it while you’re pregnant but this largely considered to be a myth. It’s generally considered to be a safe and healthy drink to consume in pregnancy, albeit one that you’re not going to want to be downing too regularly (that goes for most of us though!). 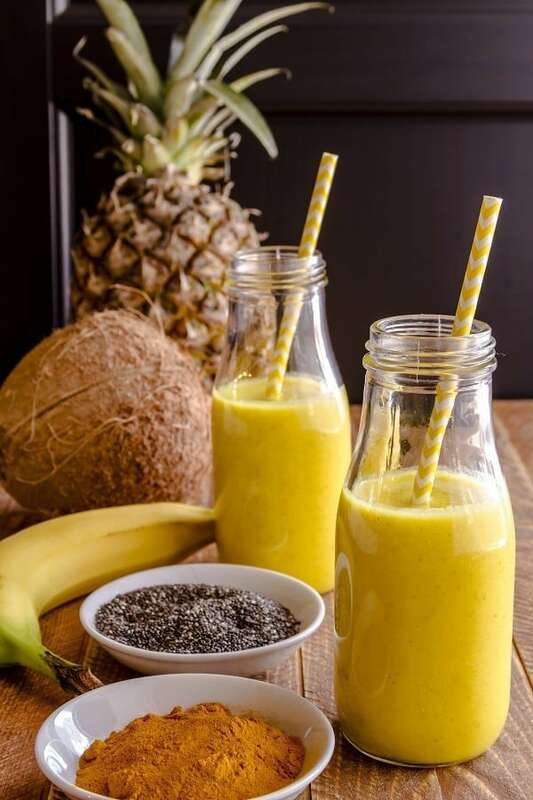 I really hope you enjoyed reading this piece and have got some inspiration for creating your own delicious and super healthy coconut water smoothie recipes. As you can see, there are lots of ways to enjoy the benefits of coconut water and I’d love to know which you liked best and your plans for your next coconut water smoothie! As always, feel free to share this piece with your friends and family so they can learn more about creating their own coconut water smoothies. And if you have any questions that haven’t been covered here, let me know in the comments.